The cheap labor wing of the business community, especially the US Chamber of Commerce, and the House Republicans’ principle-free leadership have come up with a plan to pass a bill granting amnesty to illegal aliens that shows just how contemptuous of America outside the Beltway these Washington insiders have become. What’s their plan? Stall around until after filing for the Republican primary elections closes and then ram an amnesty bill through Congress. 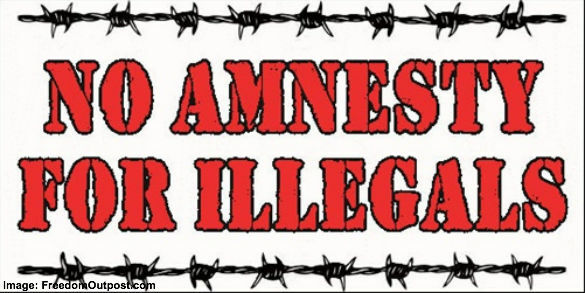 The House Republican leadership – particularly Representative Paul Ryan, Speaker John Boehner and Majority Leader Eric Cantor – are expected to rollout their amnesty bill during the House Republican retreat coming up the end of January 2014. When you receive an answer from your Representative or Senator please let us know and we will add that name to our Honor Roll of No Amnesty Pledge signers or List of Shame of amnesty supporters as appropriate.